Mongolia, as a country, seems to be a destination less travelled. I know only three friends who have been there, but all of them said it was worth their time and money to visit. I had tried to plan a trip during the (Korean) holidays of Buddha’s Birthday and Children’s Day (early May), but things just didn’t work out. Why, you ask? Well, early May is the tail end of Mongolia’s winter and thus riding camels is not an option at that time, not to mention the cold temperatures. Camel riding was one of the main reasons I wanted to go- so I postponed my trip. Mongolia’s peak tourist season, and for anything requiring one to go outside really, is late May- early Sept, with June & July being the ideal months to visit. Mongolian winters are HARSH, to say the least. Average temperatures drop to -30 C (that’s -22 F)! As it turned out, one of my close friends was planning a month-long trip to Mongolia for our university’s next break. So, we decided to take the trip together. For the sake of this blog, I will stick to the highlights, cautions and information only, but let me first put this out there: I couldn’t have done this trip with anyone else except Frances (the woman I went with). Mongolia is one of those places (and the tours, one of those adventures) that will test the relationship you have with the people you’re traveling with. I’ll expound more about that in a minute. I’ll assume you’re taking a tour, as there really isn’t anything else to do there. First, you should travel with someone.Tours are much more expensive when going solo. You can have people you meet in Mongolia join a tour you plan to take, but in my opinion, that’s a big emotional risk- not what I would want to do- for sure. We booked a 15-day tour through Khongor Expeditions. I can’t say enough (good things) about this company! There are tons of tour companies out there, and almost every guest house organizes tours, but Khongor came highly recommended, has great reviews and simply is the place to book your tour(s). They are slightly more expensive, but rest assured, they are worth it! We talked with several people while at various sites, and they noted how often their drivers got lost, adding hours and frustration to travel time. Some mentioned that their drivers would drive sleep deprived and drunk from the night before, not to mention the lack of problem-solving skills when faced with flooding, flat tires, sand storms, etc. 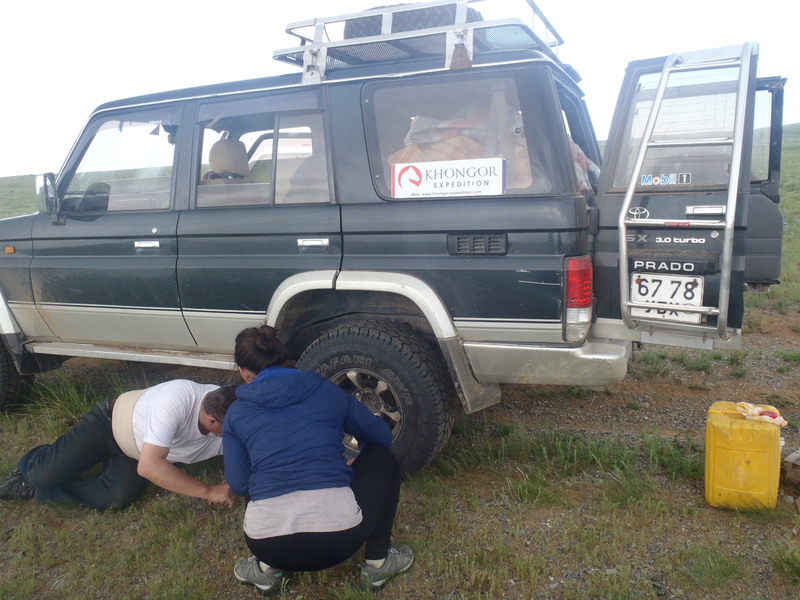 We experience flat tires, sand storms and flooding, but with a confident, kind, competent driver and guide. This made our trip! 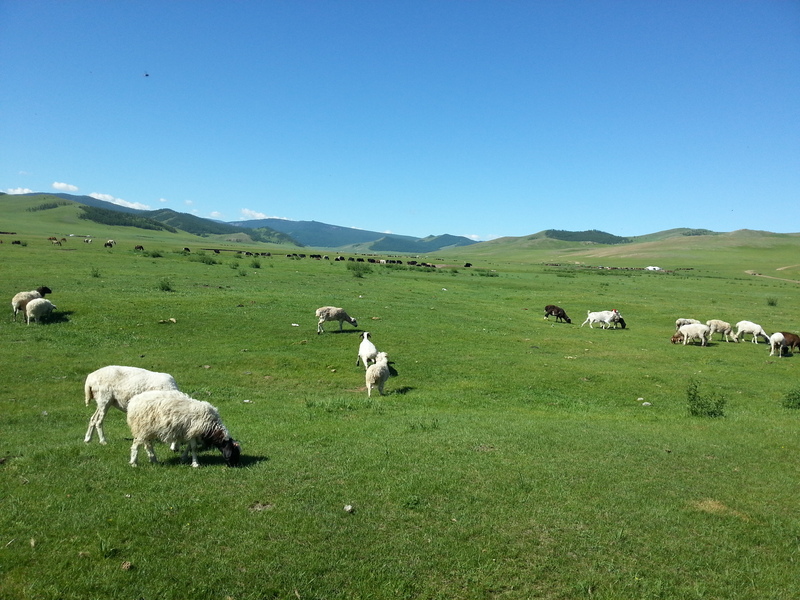 With our 15-day tour, we covered most of Central, Northern and Southern Mongolia. We didn’t go far east or far west, but we happened upon a reindeer family who was traveling for Naadam (see below). 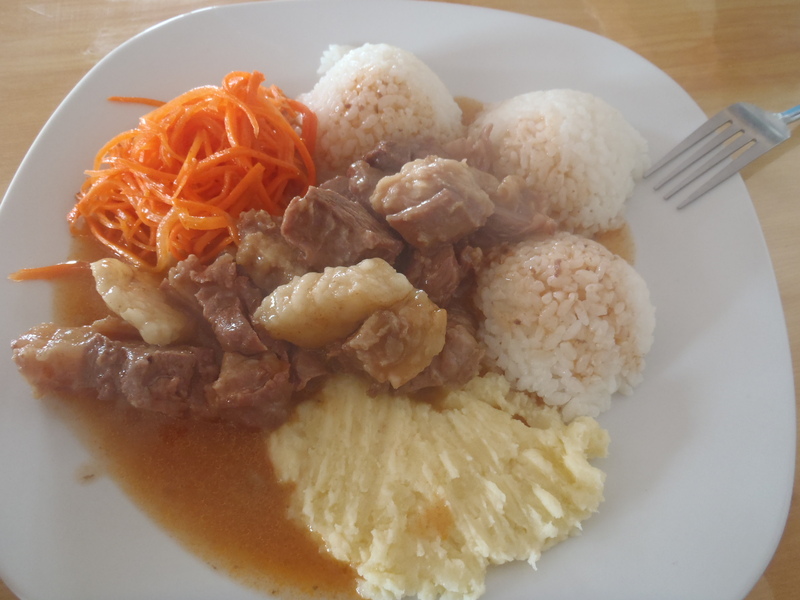 The staple food in Mongolia is lamb, potatoes and carrots. Expect this in every meal you have (breakfast is usually an exception to this rule). If you are a vegetarian, vegan, or have special dietary needs, you can ask your tour company to adjust the menu for you, although, it should be noted that you’ll likely not have a lot of variety or choices~ it’s just a part of the adventure. Mongolians tend to eat lots of fat on their meat in order to pad up (insulate themselves) for winter. If you’re not a big fan of eating hunks of fat, just ask them to remove it for your meals. 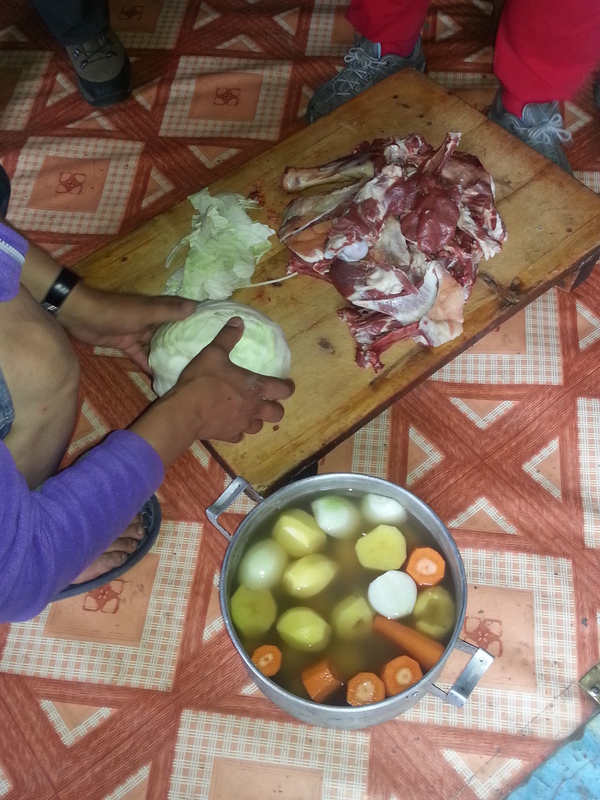 Additionally, Mongolians eat EVERY part of the animal. Don’t be alarmed though, they realize most foreigners aren’t keen on that and won’t likely serve innards to you. Another great reason to book a reputable tour company: they are used to (and are able to) meeting the needs of tourists. 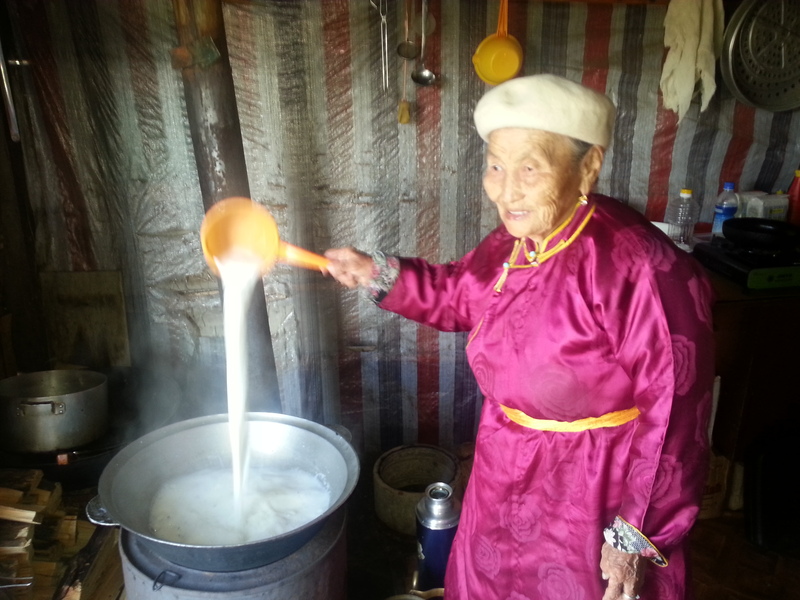 If you happen to be an adventurous eater, Mongolia provides some great things to try: various forms of camel, sheep and mare milk. In particular, their national beverage, Airag- fermented mare’s milk- should most definitely be sampled. 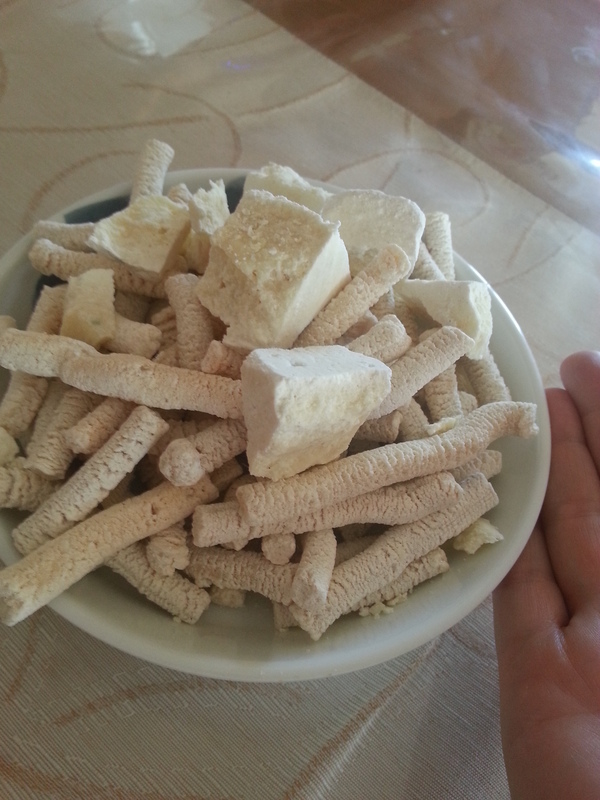 We had various forms of yogurt, cheese, dried milk treats and even got to observe one of the host families making yogurt. 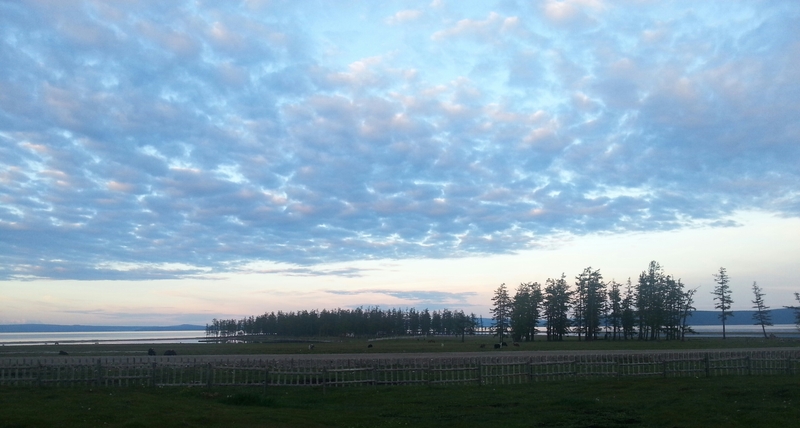 The main reason to go to Mongolia is to take in the wide open landscape. While riding in your jeep/van/bus all day, you’ll take in some truly magnificent landscapes. It’s very common not to see anyone else for (literally) almost an entire day. You will get to see plenty of livestock roaming freely, which is a site in and of itself. I had never seen yaks, kites (I learned that that’s a bird lol), hawks, nor camels freely roaming land before. I had seen a few of those animals in zoos, but not in “real life” in their own natural habitat. WOW!! Riding a camel in the Gobi Dessert was definitely a highlight for me. 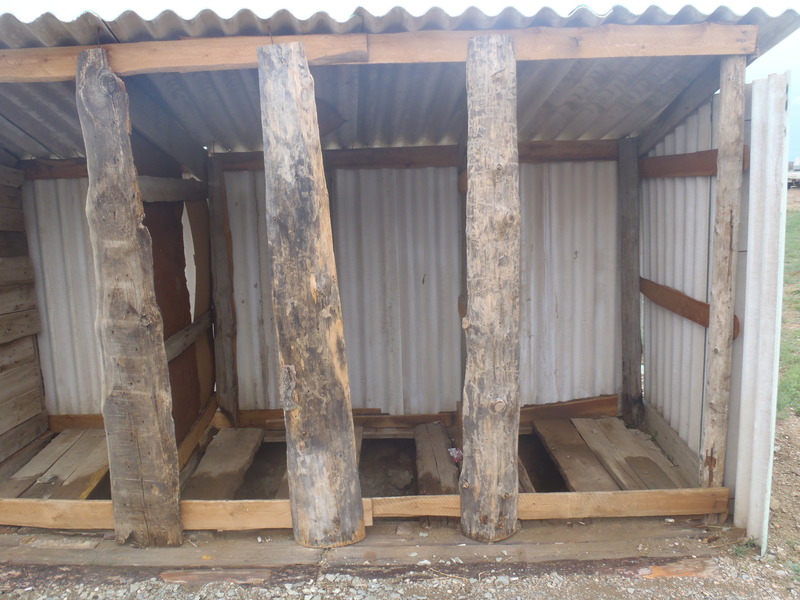 Nature is also your toilet while you’re in Mongolia. Some camps have a latrine but you often hope for the wide open landscapes as the heat makes the latrines quite hard on the nose. If you have “stage fright” about doing your business out in the open, you may want to reconsider a trip to Mongolia. The fun part is, you can make some memorable stories! I can now say I have used a YAK as a shield from my fellow travelers’ eyes while doin’ the do outside. hahaha Mongolian adventures, indeed! Naadam is Mongolia’s biggest holiday/festival and occurs in the month of July every year. It lands on different dates each year, so be sure to check the world wide web for specific dates. We happen to be “on the road” (on our tour) when the capital city of Ulanbaatar (UB) planned to hold the grand “three games of men”: wrestling, horse racing and archery. Fortunately for us, our tour guide and driver helped us find a local festival where we spent a few hours watching the games and enjoying the food. Naadam in UB is by far the largest celebration of the games, but be careful as it is high time for pickpockets to take advantage of tourists not paying close attention to their belongings. Let me try to keep this brief, but you are roughin’ it! Sleeping on hard, lumpy “beds” for most of the tour, with your travel companions 24/7 (or however long your tour lasts- in my case 24/15), and basically are never separated from one another. No, not even to use the restroom. Showers are available about every 5-6 days and the daytime can be quite hot. Roads don’t really exist so you’re on very bumpy terrain for hours at a time, sometimes as much as 13 hours a day. While this makes for really good memorable moments and lots of adventures, it’s not always easy to stay happy and friendly, especially if your personality is not that positive to begin with. lol Fortunately, we (my travel companion and myself) are quite positive people who have mature communication skills. This was key for us staying good friends throughout the trip. I bring this up because it is something you must consider when you’re deciding to go and with whom you’ll go with, especially if you plan to add strangers to your tour group. Extra batteries (or a charger with adapter) for your camera. Electricity is sparse at best. Small items you can give as gifts to your host families and to your your guide/driver. Most hostels are in apartment buildings and it’s quite alarming when you first rock up to them. Don’t worry, most of them are nice inside. I recommend Khongor Guest House, or if you’re looking for more of a lively backpacker vibe, go to Golden Gobi. Both are in a great location and within walking distance to food and shopping in UB. Lastly, as always, I’ll include a budget guide! These are peak season prices, but it’s likely you won’t go in the winter. What would be the point!?! Meals (when not on tour): Foreign food ~ $12 per meal, Local food~ $4 per meal. This entry was posted in Uncategorized and tagged abroad, adventure, backpack, backpacking, camels, expat, foreigner, Gobi Desert, kasham, kasham76, Lake, Mongolia, reindeer, reindeer people, ride, rough, sightseeing, tours, travel, UB. Bookmark the permalink. I had a friend who lived in Mongolia for 2+years. Looking at your post, I definitely want to visit. I wonder if it would be hard to do a tour with a toddler… ummm. Anyway, thanks for the post!